The Card Grotto: Happy Easter! Better late than never huh? Well I have been on nights and finished this morning so I do have an excuse for nearly missing all of Easter. I made this card for my friend Ruth which is actually the only card I managed to make this year .. I had visions of so many more lol never mind ... 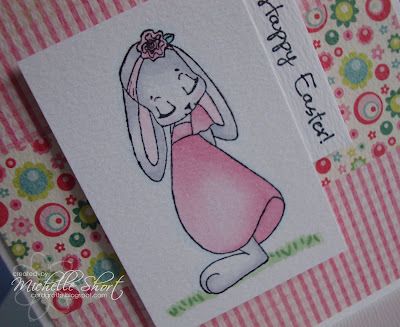 I have used the very cute CC Designs April stamp and coloured with Copics; cut out and added to base with 3d foam pads. The base is a sheet of MME QC Mary Mary - Best Of Friends Paper - Play (both sides) - can you tell I LOVE this paper?! 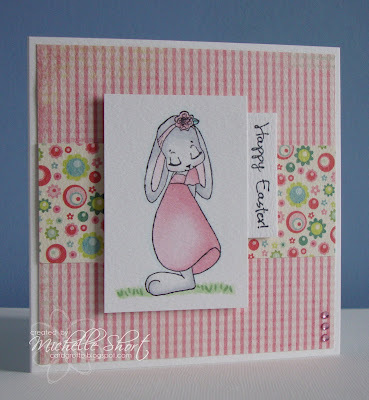 I have then stamped the sentiment (Elzybells Eggstravaganza Sentiments) and popped behind the image. Gem stones added to finish. STAMPS: CC Designs, Elzybells Art Stamps. INK: Memento Tuxedo Black. CS: Craftwork Cards, My Minds Eye. ACCESSORIES: Papermania Adhesive Gems, Copic Markers: C00, C0, RV000, R81, R83, G21, G24, B0000. Aww, she's so sweet and shy! Such a cute card Michelle! Love the sweet bunnie and the gorgeous paper. Well Michelle, I feel well and truly honoured LOL! This is such a sweet and pretty card with gorgeous colouring and I LOVE it, thanks so much! I love that paper too, I'll have to keep an eye out for it. This is lovely Michelle, I happened upon your blog as it was just above mine on the Crafty Blogs Website. I'm so glad I found it. Your work is super; beautiful colouring and clean and simple lines...wonderful.